Thanks to facebook photos, I can now provide content and embarrass myself at the same time. So today's entry is devoted to photos of me as a scrawny blonde with a serious BSC fixation (not pictured). I remember realizing (this was in fourth grade, I think) that if I wanted to, I could read books at lunch. I didn't have to talk to anyone if I didn't feel like it! This was truly a revelation, one that probably coincided with a particularly exciting Unicorn Club book. 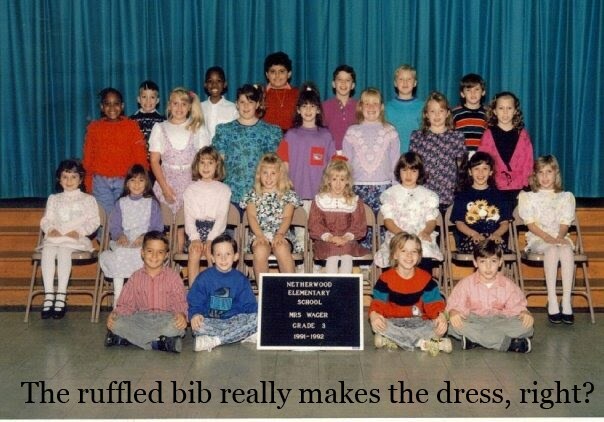 Here I am (third row, seated fifth from left) wearing an outfit picked by Richard Spier. The fact that my hair is curly means that I spent the previous night sleeping with a head full of foam rollers. Comfortable! I'd be willing to bet that the three red buttons on the dress bib are heart shaped. I'm gonna pretend that this was my tribute to Jenny Prezzioso. Really, it's just that my mom was a sucker for super girlie dresses*, and I was too busy reading books and being peanut-sized to realize I looked like a porcelain doll. Here I am again, front and center for the fourth grade chorus photo. (I have the voice of an angel. 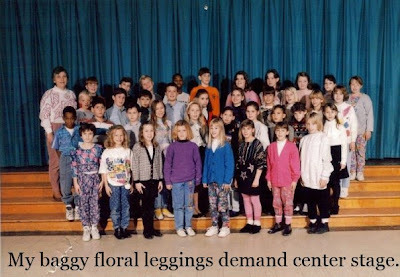 **) Maybe because the photographer was so taken by my floral leggings-and-turtleneck combination that he was like "you! Little girl! That cardigan is totally rad! Come forth so we can bask in the glory of your ensemble!" But probably because I was short. Some of you might be waiting for me to comment on the other little fashion plates in these photos. But I'm not going to, because some of these people have found me on facebook. So there's a small possibility they might be reading this, and I don't want to worry about making enemies. Then again, I will probably never see those people again, as I don't plan on attending any high school reunions. There are two important reasons behind this: 1. I have a shockingly bad memory and would not be able to reminisce appropriately. 2. I have an irrational fear of attending a real-life version of Liz Lemon's high school reunion. Anyway. Sorry if this was too much fashion for one entry. It's kind of overwhelming, I know. * These days, she mostly just despairs over the blandness of my wardrobe. "It's okay to wear color, Kim," she says. B. likes to bring this up whenever we're out shopping and I'm adding more grey t-shirts to my collection. April 1st marked the blog's three year anniversary! Thanks to everyone who's been a part of this project - your links, comments, and e-mails make my day on the regular. To celebrate, I went through the archives and compiled a list of my favorite entries. They used to be some of your favorite entries too, but my comments are still AWOL (yes, I'm bitter). 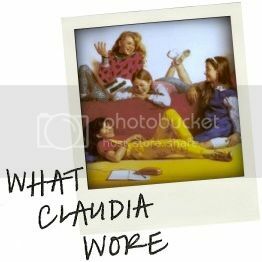 For those of you who are recent converts to the School of Claud, feel free to waste valuable hours of your life getting caught up. Just try not to get fired in the process. A Moment with . . . woah! Woman, What Are You Wearing? There's been a lot of BSC-related press recently, thanks to the recent release of the prequel. I'll point you to two articles that I was lucky enough to be involved in -- Monica Hesse's Baby-Sitters Club returns and Tali Yahalom's The Baby-Sitters Club's New Cult Following. Thanks to both for taking the time to chat with me! And thanks again to all of you for reading and playing along. Because you can always count on me*, and I can count on you. * except for regular updates. You can't count on that.